When botanist John Bartram first identified a hydrangea native to the U.S. in the 1730s, little did he know it would become a mainstay of the garden with its iconic flowers implying romance with their blustery beauty. Hydrangeas populate millions of gardens and with good reason. They can be used as specimens in a place of honor, as partners in mixed beds, in containers and even as hedges, said Heather Stoven, a horticulturist with Oregon State University Extension Service. And with the continuing frenzy of breeding, new, cool cultivars come on the market on a regular basis. But with all the species available – mophead, oakleaf, panicle, smooth or H. serrata – there really is one for every garden. To clear things up, Stoven unlocks the mystery of hydrangeas and offers her tips on how to grow them. Here it is. The famous mophead hydrangea (H. macrophylla) is the plant everyone imagines when thinking of hydrangeas. The big, bouncy blossoms of Hydrangea macrophylla give it the common name mophead hydrangea and make it the showiest of the genus. Flowers appear in shades of pink, purple, blue and white. Native to coastal Japan, mopheads, which are also known as bigleaf hydrangeas, are a little less cold hardy than other species. They’re fine in Zones 5 through 10 and some will tolerate Zone 4. 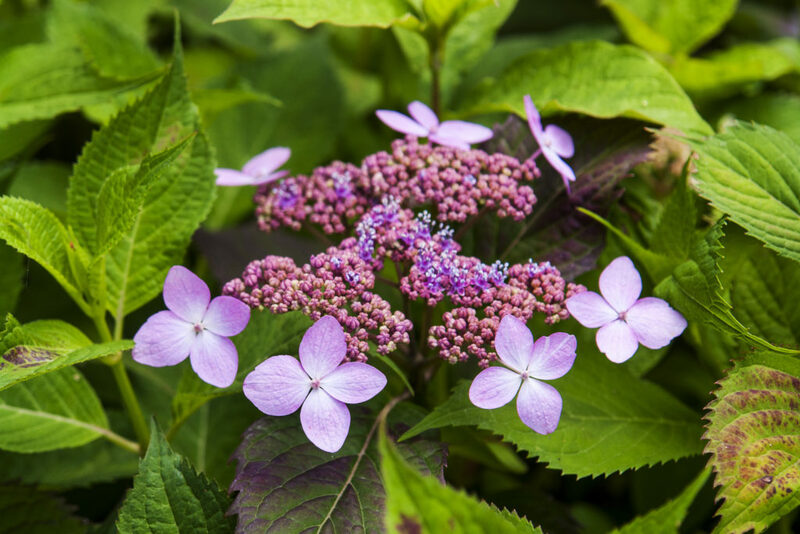 Though known for those big mophead flowers, some H. macrophylla show up with lovely lacecap flowers, which are flatter, less full and have sepals that look like petals in a circle around the flower. Though perhaps not as obvious as the mophead flowers, a plant full of lacecap flowers will not disappoint. The plants range in size from 2 to 10 feet, but are most commonly 3 to 5 feet. Like all hydrangeas, H. macrophylla needs even moisture, so keep them watered. Plant them where they will get afternoon shade or they will burn in the hot summer sun. About 20 years ago, the first hydrangeas that bloom on old and new wood – called remontant – were introduced to the public. This was a huge breakthrough because it means flowers develop throughout the season instead of just once, giving a longer season of bloom and more flowers. ‘Endless Summer’ started the stampede, and the resulting publicity put hydrangeas fully on the map after years of languishing popularity. Some other remontant types to look for include ‘Bloomstruck’ from the Endless Summer series, ‘Starlight’ from the Let’s Dance series, ‘Revolution’ from the Plants Nouveau Everlasting series and ‘Fire Island’ from the Seaside Serenade series. Similar to H. macrophylla is H. serrata, a smaller, more compact shrub. Most have lacecap flowers, but some sport the mophead type. H. serrata a little more finicky than mophead hydrangeas, and needs protection from hot, sunny, windy spots. So plant in a mostly shady spot. H. serrata is hardy to Zone 6. If you admired a hydrangea in grandma’s garden, it was probably H. arborescens or smooth hydrangea with huge mophead blossoms in pink or white, but not blue. Native to the Eastern U.S., H. arborescens gets 5 to 7 feet, though dwarf varieties are hitting the market. Smooth hydrangea needs shade and is hardy in Zones 3 through 9. 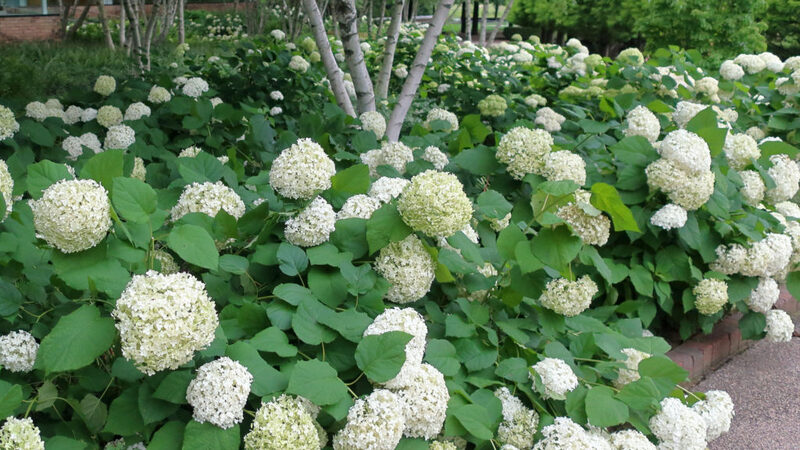 The best-known of the smooth hydrangeas is the old-favorite ‘Annabelle,’ a large shrub with huge white flowers. Breeding is bringing out varieties with even bigger blooms on stronger stems, such as Proven Winners’ ‘Incrediball,’ which is white, and ‘Invincibelle Spirit,’ which is pink. 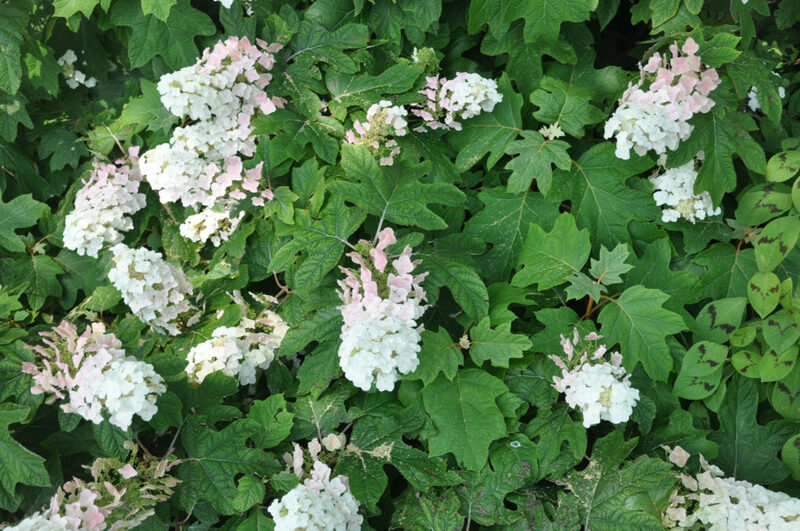 Most commonly known as panicle or Peegee hydrangea, H. paniculata has elongated flowers in white, pink or greenish-white. The long flowers make quite a show and turn various shades of pink as they age. 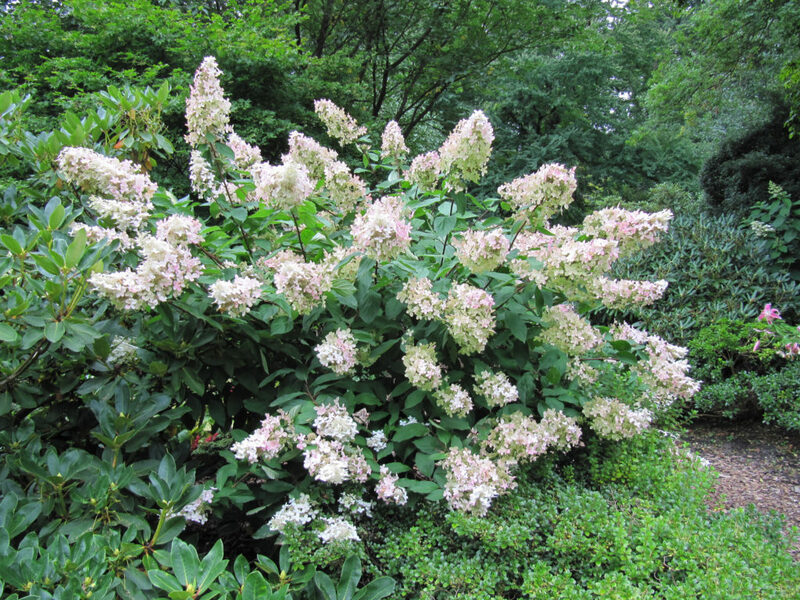 H. paniculata is the hardiest of the hydrangeas, growing successfully down to Zone 3. Earlier cultivars grow up to a height of 10 feet, but newer ones stay in the 3- to 5-foot range. The best known of the newer varieties is ‘Limelight,’ which gets about 6 feet tall and wide and sports 8-inch, greenish-white flowers. Other new ones include ‘Pinky Winky’ and ‘Vanilla Strawberry.’ Panicle hydrangeas can take full sun if kept moist enough, and should have at least several hours. This attention-getting hydrangea can be grown as a single-trunk standard form. Smaller varieties do well in containers. Planting: Choose the right site. Hydrangeas can be picky about what sun exposure they get so check the recommendation when buying. Avoid planting in hot weather. It’s best to plant from spring to fall. If you care about the color of the flowers, do a soil test to determine pH. See “Bluing” below. If you determine you want to change the color, planting is a good time to add sulfur or lime. Dig a hole two times the size of the plant’s rootball. Cut any circling roots. Fill the hole in with native soil mixed with organic material. Place mulch over the planted area and water well. Fertilizing: Use a slow-release well-balanced (the three numbers on the label are the same or close to the same) fertilizer in spring. Fertilizing too much, especially with a fertilizer high in nitrogen (N) can bring on too much foliage and not many flowers. Avoid fertilizers high in phosphorus (P) if you want blue blooms. Watering: Hydrangeas were named for a reason. Hydro means water in Greek and Angeion is vessel. So think of it this way: Hydrangeas are a vessel that holds water. In other words, don’t skimp on the water. Keep the plants evenly moist, but in well-drained soil. Pruning: When to prune depends on if the plant blooms on new (current year) wood or old (last year’s) wood. If it’s new wood, prune in late winter or early spring. If it’s old wood, prune in late summer after blooming. Flowers can be deadheaded at any time, but be sure not to cut off the flower buds. Hydrangeas don’t need heavy pruning unless you want to reshape or resize it. In that case, cut out no more than a third of the plant by pruning old wood to the ground. At the appropriate time of year, prune for height by cutting back as far as you wish, but you may lose some flowers the following year. Blooms can be snipped at any time as long as you leave the buds. Keep in mind there’s no need to prune every year. If it looks good, just deadhead and remove dead wood. H. macrophylla, H. serrata and H. quercifolia bloom on old wood, except the newer remontant forms of mopheads like ‘Endless Summer.’ H. arborescens and H. paniculata bloom on new wood. Do your homework and know which type of hydrangea you have before pruning. 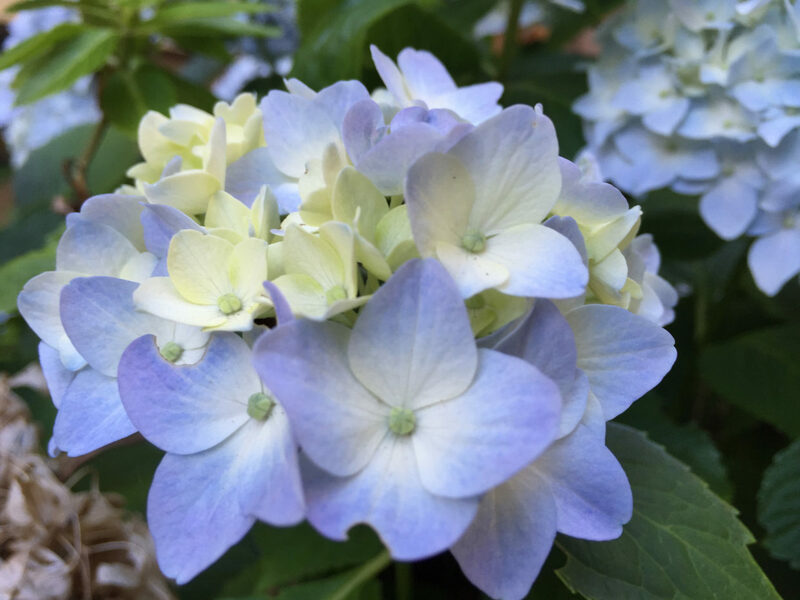 Bluing: The million-dollar question is “How do I get my hydrangeas to turn blue?” Well, first of all, not all hydrangea flowers turn blue – such as white ones – so do some research before buying. Second, you need to know your pH, so either get a soil test done or buy a pH tester and do it yourself. For pink flowers the pH should be 6.5 or higher; purple flowers result from pH between 5.5 and 6.5; blue comes from a pH of 5.5 or lower. To adjust the pH, use sulfur to lower the pH and turn the flowers blue. (Use aluminum sulfate if growing a hydrangea in a pot in a soilless potting mix). If pink is your goal, go with lime to raise the pH. The best time to add amendments is fall. Changing the pH is a slow process that can take several years. For a deep dive into how to lower the soil pH see Acidifying Soil for Blueberries and Ornamental Plants in the Yard and Garden. Thanks, Kim. Good article. I’ve enjoyed H.p. Quick Fire for several years.